A LITTLE jolt as I was just clearing through an old chest – as I found the cuttings from a story I’d done about an abandoned baby. 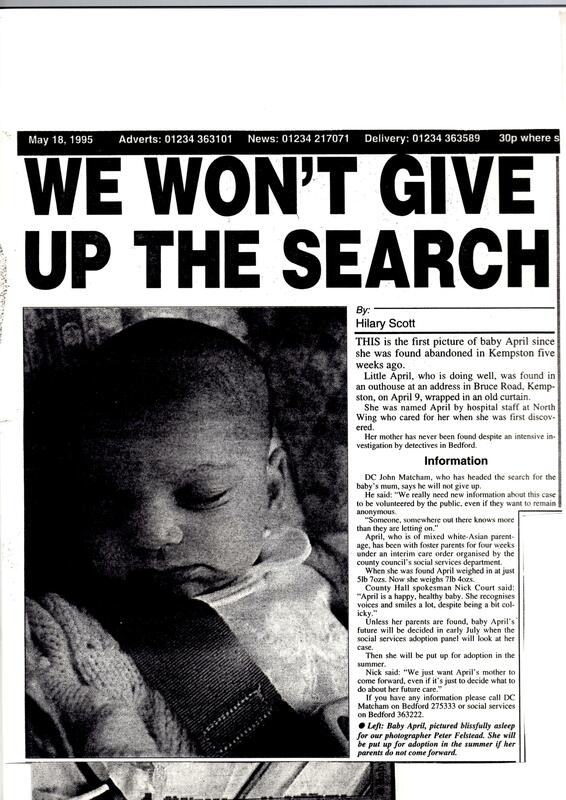 Back in 1995, on April 9, a newborn baby girl was found abandoned in an outhouse in Kempston, just outside Bedford, where I worked as a junior reporter on the Bedfordshire Times and Citizen. Nurses at the hospital named her April, and as far as we were aware, they didn’t find her mother. She was thought to be of mixed asian-white parentage and police suspected that her mum was possibly very young and from a strict family who would have dis-owned her had she revealed the pregnancy to them. Terribly, terribly sad. I hadn’t had children myself at the time of reporting the story. To be honest, I’d forgotten all about it. Now I have four children of my own, I admit I had a lump in my throat reading the story back, wondering what happened to those involved. Hopefully, baby April and her mum were re-united. Perhaps she went up for adoption and had a wonderful life with new parents who couldn’t have children of their own. If she wasn’t ‘reclaimed’, I bet that there hasn’t been a day over those 16 years when that mother hasn’t thought about her baby and her agonising decision to give her up. Happy birthday April, if that’s still your name. I hope you had a brilliant 16th party, and that life has dealt you a better hand than the one you started with all those years ago.